533 mm Mk151 х 5 pcs. 20 mm Oerlikon Mk206 х 2 pcs. Kidd — American premium Tier VIII destroyer. A Fletcher-class destroyer that has powerful anti-aircraft armament and a high speed. In May 1945, she was modernized to receive enhanced AA armament by removing her forward torpedo launcher. USS Kidd is now preserved as a military museum ship in Baton Rouge, Louisiana. She was first released for sale worldwide on 10 November 2017. Kidd plays like the love-child of Fletcher, Benson, and Sims. Hull-wise, she is a Fletcher-class destroyer, with the guns of her Tier IX parent. However, unlike Fletcher, Kidd fulfills a more niche role and plays similarly to Sims. She also has a single launcher of Benson torpedoes, completing the composition of this Frankenstein-esque Tier VIII premium destroyer. Having the hull of a Fletcher-class destroyer, Kidd gains access to a rather impressive array of anti-aircraft armament and the Defensive AA Fire ( ) consumable. Fully committing to an Anti-Aircraft Build will cause Kidd to become a respectable opponent for enemy aircraft carriers (or, more precisely, a target to be actively avoided). Even without fully investing in the skill and modules for AA firepower, triggering Defensive AA Fire ( ) will cause no small amount of concern to enemy planes. In addition, Kidd has all the firepower of Tier IX's Fletcher, boasting five (5) fast-firing 127mm guns; perfect for the role of decimating enemy destroyers or severely annoying larger surface ships. She's also uniquely equipped with the Repair Party ( ) consumable, adding to the survivability afforded by her relatively large health pool. Maneuverability wise, Kidd straddles a line between the Benson and Fletcher: she is faster than the latter, but not as fast as the former. Her rudder shift is slightly better than that found on either ship, but she has a wider turning circle. Her concealment is on par with both ships, and her health pool sits in the middle between the two. However, all is not sunshine and roses with Kidd, as her primary fault is rather glaring: the lack of an effective torpedo armament. With only a single rack of five cumbersome torpedoes, she cannot be expected to reliably make use of them. That is not to say that they are completely useless; rather, they simply fall short when compared to the usability of other equal-tiered destroyer torpedoes. It takes a whopping 122 seconds for them to reload; additionally, they move at an uninspiring 55 knots. In short, Kidd’s torpedo armament is the same as Benson, minus one whole launcher. In playstyle, Kidd can most closely be likened to Sims. They greatly resemble each other, taking up a primary role of a gunboat that hunts down enemy destroyers, while having the Defensive AA Fire ( ) consumable to discourage enemy carrier strikes. Playing Kidd in a scouting or hunter/killer role will prove greatly rewarding, as she is best suited to the front line of combat. If taking capture points is the name of the game, then Kidd might be one of the most frightening things to come across with her Repair Party ( ) consumable allowing her to heal a portion of damage taken and engage in brutal destroyer-on-destroyer knife fights with an edge that no other Tier VIII destroyer can match. 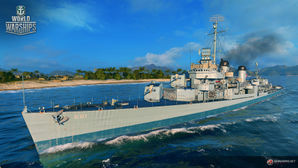 LittleWhiteMouse's Premium Ship Review: USS Kidd from the NA forums. Large health pool for a Tier VIII destroyer, trailing only German Z-23 and Japanese Akizuki (and slightly ahead of Russians Kiev and Ognevoi). Excellent main battery guns feature fast traverse, quick rate of fire, and decent firing range. Only American destroyer with access to Repair Party ( ), giving her a clear edge in survivability when facing other destroyers. Very good anti-air capabilities, even without equipping Defensive AA Fire ( ). Very low detection radius when kitted out with appropriate upgrades and commander skills. Has only one torpedo launcher with a long reload; it is difficult to consistently deal high burst damage to enemy capital ships. Sluggish maneuverability; Kidd has a worse turning radius and rudder shift time than tech tree counterpart Benson. Relies on spotting damage, capping, and bullying other destroyers to earn credits and experience. Shell velocity makes landing main battery rounds at long range difficult. As a premium ship, Kidd doesn't have any upgrades to research. Slot 2 allows players to mount Defensive AA Fire Modification 1 ( ), a special upgrade which boosts the duration of the Defensive AA Fire ( ) consumable by 20%. This is a useful upgrade to mount when fully specializing for an Anti-Aircraft Build. Propulsion Modification 2 ( ) is also a viable choice for Slot 4. Key skills for Kidd commanders include most common destroyer captain skills, such as Last Stand, Adrenaline Rush, Survivability Expert, and Concealment Expert. With only a single torpedo launcher, Kidd is not well suited to a torpedo build, so torpedo-related captain skills are less useful for her. Kidd can be specialized for an Anti-Aircraft Build by investing in a mix of Basic Firing Training, Advanced Firing Training, or Manual Fire Control for AA Armament. Mounting Defensive AA Fire ( ) is recommended over mounting Engine Boost ( ) to help shoot down or deter enemy aircraft nearby. Damage Control Party II ( ) and Repair Party II ( ) are recommended for captains looking to improve the ship's survivability. Additionally, mounting Smoke Generator II ( ) is recommended for the shortened cooldown time it offers. As a premium ship, Kidd comes included with Type 10 camouflage that lowers her detection radius, reduces the accuracy of incoming shells, and increases the amount of experience she earns. As a destroyer with great anti-aircraft firepower, Kidd can utilize a variety of combat signal flags to her advantage. November Echo Setteseven ( ) can be mounted to further boost Kidd’s anti-aircraft firepower, while signal flags such as India X-Ray ( ), Victor Lima ( ), and Juliet Whiskey Unaone ( ) boost the strength of her main battery guns and torpedoes. November Foxtrot ( ) and Sierra Mike ( ) are standard fare for most destroyers, however unlike most destroyers Kidd can make use of India Delta ( ) flags as she is one of the few destroyers in the game with the Repair Party ( ) consumable. Finally, Juliet Charlie ( ) is a recommended option for captains concerned about an unfortunate early exit to port via detonation. As Kidd is a premium ship, the economic and special signal flags can be mounted to further boost the economic and experience gains of the ship. Kidd challenges the mighty Tirpitz. Flag of USS Kidd. Given to players who purchased a special bundle containing Kidd. The Fletcher-class ships were the first destroyers in the US Navy to exceed 2,000 tons displacement. In a change from previous design practice, Fletchers had flush decks as opposed to the raised forecastle design seen on the Benson class. This increased her length but decreased her freeboard and improved her handling; overall, the Fletcher class was considered a very structurally sound and seaworthy design. An interesting design choice to note: early build Fletchers had a taller, rounded-tower superstructure design – as seen on the in-game model for Fletcher – whereas late-build Fletchers (such as Kidd) had a superstructure that was lower in height with a flat-faced bridge. In order to maintain the 38 knot speed despite the increase in tonnage, new propulsion machinery was utilized: boilers that were 20-30% more efficient and turbines that were 20% more powerful than predecessors were installed. Ultimately, a third of the internal space was consumed by propulsion machinery in a unique configuration. The forward boiler and turbine room were separated from the rear boiler and engine room via watertight bulkheads. Each individual segment ran the port and starboard propulsion screws, respectively. This configuration resulted in greater survivability of the machinery spaces when dealing with combat damage. In light of the mounting ferocity and desperation of Japanese kamikaze attacks against US carrier strike groups late into the Pacific campaign, the Navy saw it fit to increase anti-aircraft potency in picket ships however possible. In 1945, about 55 Fletcher-class destroyers – including Kidd – had their forward torpedo tubes removed to install an anti-aircraft platform mounting two quad-barrel 40mm. In addition to the three existing dual-barrel 40mm emplacements, the total was brought up to fourteen (14) 40mm AA guns. Furthermore, the seven (7) single-barrel 20mm were replaced with six dual-barrel emplacements, bringing the total up to twelve (12) 20mm AA guns. In the end, 175 Fletchers were produced from 11 shipyards throughout the United States. USS Kidd (DD-661) was the 133rd Fletcher-class destroyer to be produced, named after Rear Admiral Isaac C. Kidd (killed in action during the sinking of his flagship USS Arizona on 7 December 1941). With the sponsorship of Admiral Kidd's widow, Federal Shipbuilding and Dry Dock Co. in Kearny, New Jersey built the namesake destroyer; she was laid down on 16 October 1942 and launched on 28 February 1943. USS Kidd (DD-661) was commissioned into the United States Navy eight weeks later on 23 April 1943. Following her shakedown, she cruised the Atlantic and Caribbean before departing to the Pacific as part of the escorting fleet of USS Alabama (BB-60) and USS South Dakota (BB-57) in August 1943. Shortly after she arrived at Pearl Harbor, she was tasked with escorting aircraft carriers to Wake Island until early October. Come mid-October, Kidd joined a formidable task force set to strike Rabaul and support the landings at Bougainville. During this time in the dangerous southern islands, Kidd broke off from her formation to rescue the crew of a plane launched from USS Essex (CV-9). While she was recovering the air crew, a mass of Japanese planes fell on her in an attempt to sink her while she was isolated. Her AA guns lit up the skies, shooting down three Japanese planes and successfully completing the rescue without taking damage. Kidd remained in the southeastern Pacific screening Allied ships and bombarding shorelines before returning to Pearl Harbor by early December, where she remained through the New Year. By 11 January 1944, Kidd was back at sea, sailing for the Marshall Islands to screen the assaulting American forces. From March through April, Kidd guarded an airstrip under construction on the island of Emirau, later supporting operations off New Guinea. She fought in the Marianas campaign from June through July, bombarding Guam for impending invasion. Following some hard months of service, Kidd returned to Pearl Harbor for repairs in late August 1944. She departed Pearl by the 15 September, arriving at the Manus by early October. From there, she joined the gigantic Philippines invasion fleet, entering Leyte Gulf on 20 October. During the initial stages of the invasion, she screened landings and provided fire support across the Philippines, before returning to Mare Island, California (via New Guinea), arriving there on Christmas Day 1944. Kidd’s next sortie came on 19 February 1945, as she joined Task Force 58 on their way to Okinawa. Kidd screened Allied ships, protected landings, bombarded key targets ashore, rescued down pilots, protected heavily-damaged USS Franklin (CV-13) and shot down kamikazes. While defending a picket station in early April 1945, Kidd along with her division mates USS Black (DD-666), USS Bullard (DD-660) and USS Chanucey (DD-667) repelled three air raids on their position. After the third raid, a single Japanese plane crash-landed on her deck, killing 38 men and wounding 55. Damaged and down on manpower, she returned slowly to Pearl Harbor for repairs, transferring all the way back to San Diego on 24 September 1945 for deactivation following the end of World War II. She was decommissioned on 10 December 1946 and entered the Pacific Reserve Fleet. It was to be a brief respite. Kidd re-joined the active United States Navy a mere five years later with the outbreak of the Korean War. Following re-activation protocols, Kidd was recommissioned on 28 March 1951, setting sail for the Western Pacific. She arrived in Yokosuka, Japan by 15 July, joining Task Force 77. Her first actions were patrols off the southern Korean coast, until she was re-located to the eastern coast of the Korean peninsula. From October 1951 to January 1952, Kidd bombarded targets of opportunity along the coastline, until she was ordered to return to San Diego, arriving there on 6 February 1952. She returned to Korea by mid-September that year, patrolling off the North Korean coast after truce talks began. She remained stationed off Korea until she was to return to San Diego, via Midway and Pearl Harbor, for an overhaul, reaching San Diego at last on 20 March 1953. Kidd remained in active service until 1964, sailing across the Pacific and visiting ports in Japan, Okinawa, Hong Kong, the Philippines, and Australia. In 1960, she was transferred to the Atlantic Fleet, cruising the Caribbean and the Atlantic. By mid-June 1964, Kidd was decommissioned and joined the Atlantic Reserve Fleet, berthing at Philadelphia. In 1982, Kidd became one of three Fletcher-class ships chosen to be preserved as wartime memorials. She was towed from Philadelphia to Baton Rouge, Louisiana, where, on 23 May 1982, she was transferred to the custody of the Louisiana Naval War Memorial Commission and became a military museum ship. Kidd is the only preserved U.S. Navy destroyer to retain her World War II appearance, as she has slowly been restored back to her August 1945 configuration (a process that took nearly 15 years of hard work by volunteers and a variety of equipment donations). Kidd is famous today for her excellent state of preservation and maintenance, and frequently hosts events on her decks. Her special mooring configuration accounts for the drastic seasonal variations in the depth of the Mississippi River, allowing her to float freely in spring and summer when the river runs high, and resting her gently on a series of blocks that support her keel when the river level drops in fall and winter. Ship's emblem of USS Kidd. USS Kidd (DD-661) as she appeared early in her career, circa 1943 or 1944. Kidd anchored at Roi, Kwajalein, 1944. Kidd off Mare Island, California, 8 February 1945. She was in overhaul at Mare Island from 25 Dececember 1944 until 11 February 1945. Kidd, circa 1950, location unknown. Kidd underway at the time she was recommissioned for Korean War service, circa March 1951. USS Kidd dropping depth charges during maneuvers in 1958. Kidd as she appears today, as a museum ship in Baton Rouge, Louisiana. This page was last modified on 19 February 2019, at 05:54. This page has been accessed 78,241 times.